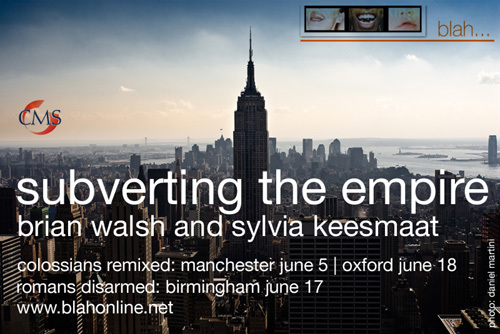 Brian Walsh and Sylvia Keesmaat, authors of Colossians Remixed: Subverting the Empire present a day’s teaching. If you haven’t read the book or think that a bible commentary sounds a bit dull think again. It is one of the best books those of us involved in blah… have read for some time. Brian and Sylvia are based in Canada so this is a rare chance to hear and meet them. Sylvia was finishing her DPhil with Tom Wright when I arrived in Oxford, and is a good scholar. I have read the commentary referred to and it is certainly an innovative and creative book, although the anti-imperial reading is so dominant that other aspects of Colossians are neglected (this is not a criticism, but an observation). I also seem to remember that using disposable nappies was understood to be a clear sign of conformity to imperial principalities and powers – oh well!